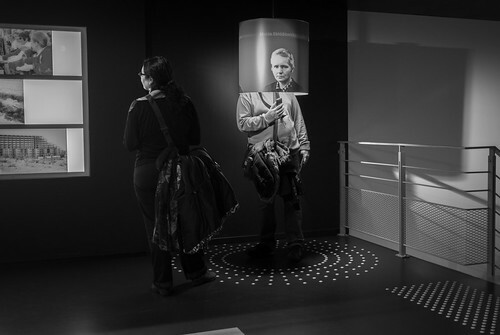 The Parlamentarium. 1/13 @f2.0, ISO 1600. The lure of street photography for me is all about the moments, moments that happen hundreds of times a day, happen all around us and happen in an instant. Moments that happen whether you are there with your camera on not. The goal then is to capture those moments. To do that you must be aware of what is happening around you and be ready with your camera at all times. that if I wanted to use this camera on the streets I was really going to have to spend some time becoming familiar with it. Along the way I've missed plenty of those moments though. That's natural. With any new camera or piece of gear, you have to use it and use it over and over so that operating it becomes second nature. This is especially true in street photography. 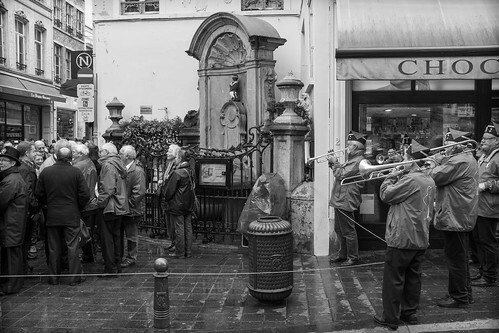 Patience allowed me to capture a clear shot of the Manneken Pis framed by a band and officials during a ceremony. 1/140 @f8.0, ISO 400. 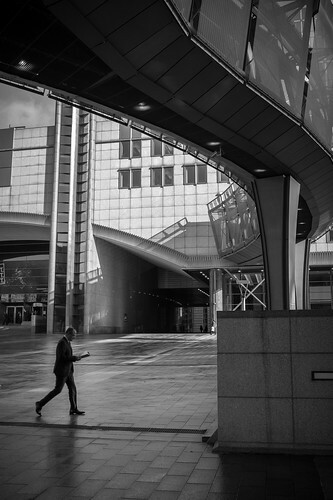 Fortunately, the learning curve is not steep with this camera and after four months of shooting, including these photos from three days in Belgium and one day in Amsterdam, I've come to appreciate the challenges as well as the positives shooting with the Fuji X100S . I use the optical viewfinder (OVF) display instead of the electronic viewfinder (EVF) which means there is no display lag when I bring the camera to my eye and it also gives me a larger field of view than that of the lens. This means I can keep track of what is happening just outside the frame without ever removing my eye from the viewfinder. However, there is still a second or two lag before you are able to release the shutter, especially when the camera has gone to sleep. One way I overcome this lag is to keep the camera turned off and then turn it on as I bring it to my eye. Using this technique, I have found the camera seems to be ready to shoot as soon as I get it to my eye. Take time to stop and just wait for things to happen. 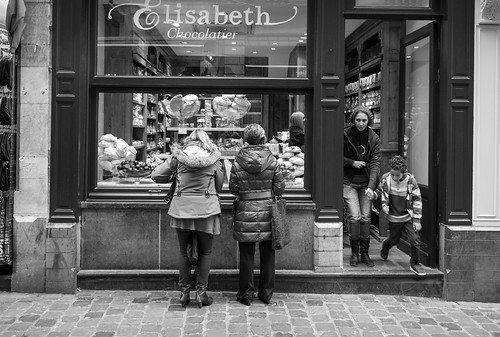 I was originally photographing the two women window shopping for chocolate in Brussels when a mother and child exited. 1/50 @f5.6, ISO 400. Again, in street photography you have to be ready for that moment and a second too soon or too late makes all the difference. One thing that I really like about the X100S is the monochrome film simulation mode and the quality of those black and white images right out of the camera. For me black and white and street photography go together, so one of the first things I did was set one of the custom functions to monochrome, which then made it easy to switch between modes. I soon found that switching between modes throughout the day takes both time and can compromise creativity. That was until I inadvertently found a solution. This scene at the Brussels airport train station is all about the color. Shooting JPEG plus RAW meant I had the color data available to me even though I had the camera set to monochrome. 1/9 @ f4.0, ISO 800 +0.33EV. Initially I was only shooting in JPEG FINE mode, however more recently I have been shooting JPEG FINE plus RAW allowing me to keep the camera set to monochrome, stay in that frame of mind creatively, all the while knowing that there is a RAW file containing original data, including color information. If I come across a scene where color plays a part, I can take the photo without having to go into my custom settings. 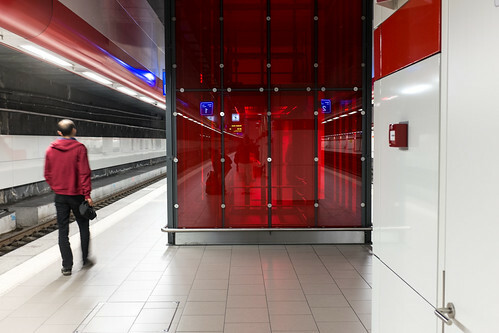 This scene at Amsterdam's Central Station, like the photo above, works because of color. Again, I knew it was about color even though the camera was set to monochrome, but not having to switch saved me time before the buses moved and the moment passed. 1/160 @f2.8, ISO 400. 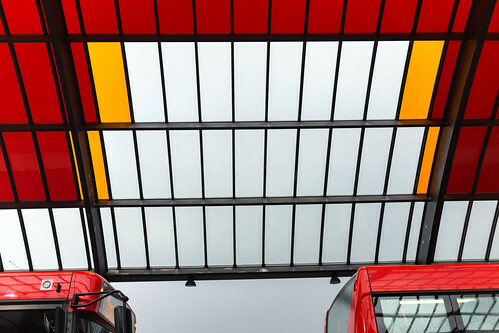 The Fuji X100S' size and feel are perfect for street photography. Not as threatening as a full frame DSLR with lens, the X100S presents itself well and feels right in your hands. When walking the streets I like to wrap the camera strap around my hand and carry the camera at chest level so when I see a scene developing, I'm only seconds away from being ready to shoot. I've also added the Fotodiox Pro Thumb Grip which helps me hold the camera securely. Then once I start shooting, I keep shooting and moving in order to get the best possible picture. Even when noticed by the subject, I'm not given the same look as if I was pointing a large 'professional looking' DSLR camera at them. The added advantage on this camera of having a preview appear in your viewfinder means you know what you are capturing without having to remove your eye from the viewfinder. Outside the European Union in Brussels. I liked the shadow and shapes created by this overhead walkway, so I waited until a person walked by. Timing is key and if I waited for the subject to take two more steps this would have been a stronger image. 1/100 @f8.0, ISO 200. And since the X100S doesn't draw any attention to itself (from non-photographers anyway) I also find that I'm able to shoot in locations that I would previously have had to worry about being stopped and questioned like a mall or store. I don't think I ever had any real doubt that this camera would be a perfect street camera for me and the more I shoot with it, the more I'm convinced of it. I'm feeling more like a photojournalist then when I actually was a photojournalist. What more can I say. Body parts for sale in Amsterdam window. 1/25 @f2.0, ISO 400.